The first and most important step in biodiversity conservation is comprehensive understanding of what we are hoping to protect. As a rule, it is those national parks that invest the most in understanding their full biological complexity that are the most successful in preserving it. We have already succeeded in stopping the loss of most major mammalian species in the park, but now we need detailed knowledge of all its other elements. This knowledge will allow us to manage the park’s natural resources and fully understand the interplay of Gorongosa’s biotic components, a prerequisite to long-term ecological restoration. Such knowledgebase also provides a rich source of material that can be used for both education and tourism. Each of Gorongosa’s ecosystems is teaming with thousands of species of plants and animals, some of which can be found nowhere else in the world. They all form an intricate ecological network that not only makes the survival of all organisms of Gorongosa possible, but also provide ecosystem services to human communities living around the park. And yet, despite the importance and uniqueness of the Gorongosa ecosystems, we know shockingly little about their biological composition. During its 50-year history, the biodiversity of Gorongosa National Park has never been systematically explored and documented. While there exists very good and current record of the distribution and abundance of large mammalian species within the park, little is known of such organisms as amphibian and reptiles, fish, bats and rodents, pollinators insects, and virtually all other groups of terrestrial and aquatic invertebrates. The flora of the park is known only from a few select sites and also needs comprehensive documentation. Piotr Naskrecki gathering insects at night. Photo by James Byrne. The E.O. Wilson Biodiversity Laboratory at Gorongosa National Park will conduct a series of comprehensive, in-depth surveys of biological diversity of the park in all its ecological zones, habitat types, and most important biological communities. These surveys, conducted by leading experts in African biodiversity and conservation, will focus on those groups of multicellular organisms that are of particular importance to the function of the greater Gorongosa ecosystem as well as those that carry the greatest promise of discovery of endemic and new to science species. Preliminary data collected during a small-scale survey of insects of Gorongosa conducted in 2012 indicate that over 90% of the park’s fauna remains unknown and that as much as 20% of its invertebrates may be new to science. Two types of biological surveys will be conducted. Rapid surveys will be 2-4 weeks-long field expeditions to different areas of the greater Gorongosa ecosystem, often never before explored by biologists, where we will sample a wide range of animal and plant groups using the latest and most effective sampling techniques. These surveys are likely to result in the discovery of many new-to-science organisms. 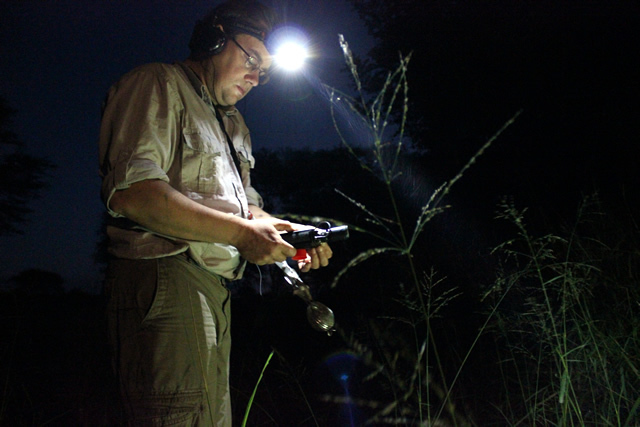 In addition to standard collecting methods, we will sample the diversity of acoustic animals (bats, cicadas, crickets etc.) using the most advanced technologies in sound detection and acquisition, including the ability to record infrasonic (signals below the human hearing range) and ultrasonic (signals above our hearing range) signatures of acoustic animal species. We will also deploy an array of automated motion-, heat-, and sound-detection cameras to document the occurrence and movement of elusive nocturnal mammal and bird species, and we will use biochemical (pheromonal) traps to obtain data on several ecologically important insect groups. Long-term surveys will involve continuous monitoring of selected groups of organisms (pollinators, nesting birds, carnivores etc.) over many-year periods. Long-term surveys will also incorporate advanced monitoring techniques, such as radio telemetry, infrared remote cameras, and ultraviolet light traps. The forest canopy—Often referred to as “The Last Frontier,” the tropical rainforest canopy is one of the least explored ecosystems on Earth. We will conduct comprehensive exploration of the canopy layer of the high elevation rainforests of Mt. 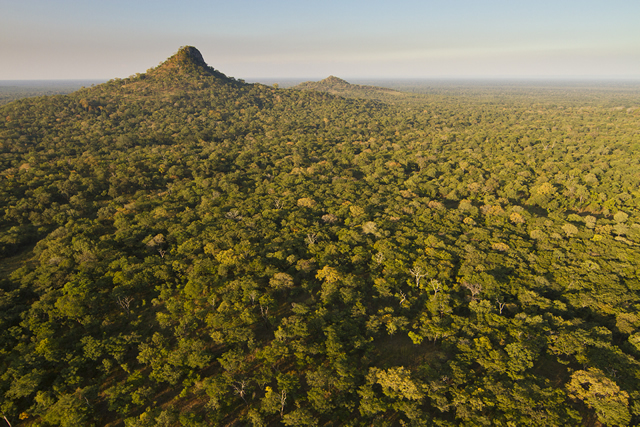 Gorongosa, including the construction of canopy access points (canopy towers and/or canopy walkways) that will allow both for long-term scientific exploration and provide a compelling eco-tourism attraction. Caves—Limestone formations of the Cheringoma Plateau, which are a part of the eastern rim of the Rift Valley, is replete with yet unstudied networks of caves and subterranean passages. These have never been systematically surveyed within the park, and belong to some of the least known biological habitats in Africa. Soil and subterranean ecosystems—The soil and all its biotic components are not only the natural foundation of most terrestrial ecosystems of the park, but also constitute a virtually unexplored and potentially very rich life zone. We will comprehensively sample and document the often nearly microscopic but nevertheless vital inhabitants of Gorongosa’s soils. Like the rainforest canopy, this exploration will result in the discovery of many organisms new to science. The results of our biodiversity surveys will create a radical, exceptionally detailed and dynamic picture of life in Gorongosa. The first survey will take place in April–May 2013, and will focus on the documentation of never before explored limestone gorges and inselbergs of the Cheringoma Plateau in the eastern part of the park. Future surveys will explore the isolated massif of Mt. Gorongosa, the Lake Urema floodplains, and watersheds of major rivers within the greater Gorongosa ecosystem.